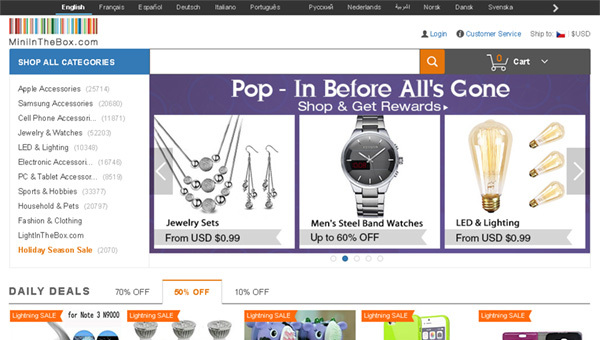 MiniInTheBox is one of the leaders of Chinese online shops that sell electronic devices and accessories. It was established in 2010 by the LightInTheBox Holding Co. Ltd. This company also owns the LightInTheBox shop. However, MiniInTheBox is specialized on different gadgets and electronics while LightInTheBox sells a wider specter of products (items for home, clothing, etc.). This shop serves clients from more than 170 countries. First of all, MiniInTheBox attracts customers with low prices and free international delivery. If you seek for items with the lowest prices and free delivery, this is the shop you need. If you order an item from expensive categories (like cell phones) the delivery, as well as the order, can be completed only from the LightInTheBox shop where you have to pay for delivery. At the same time, MiniInTheBox has left its delivery free. The payment and shipping do not differ from other shops. The available delivery services are ChinaPost, EMS, DHL, and UPS. You can pay with credit cards, PayPal, Western Union. I used to buy from miniinthebox but recently am experiencing lots of problem with their shipping methods! They make you order more to get the expedited shipping but after that it was shipped throughnormal pos and take more than 45days! Their customer service is really poor.. As they dont read your complaint and keep on sending same messages! Very pleased with the service, product, reply to queries and that they back up their product.